Last week, my newest book on Titus officially released. 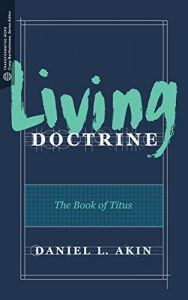 Living Doctrine: The Book of Titus is the newest volume of the Transformative Word series. I had a wonderful time exploring the Word of God to us in this short, but rewarding, book. It has much to teach us about our Lord Jesus, and it has much to say to our present day as well. I invite you to pick up a copy and join me in discovering how doctrine truly is transformative.